I have had so many people call me because they can’t deal with their existing kitchens any longer. Some of the many factors leading to a kitchen remodel include an ill-conceived layout not conducive to cooking or entertaining, lack of storage space, inadequate lighting, inefficient appliances, a dated “look” and “feel” all around or maybe their kitchen table just isn’t big enough so what they really want is an extending dining table and 6 chairs. Now imagine you have those same complaints but are entering into your senior years and can no longer move around like you once could decades ago? In this blog post, I want to talk about kitchen remodeling tips necessary for seniors aging in place in Geneva IL and across the suburban Chicagoland area. The term “aging in place” refers to those active older Americans who want to live safely and independently in their own homes instead of moving to a senior community. Sometimes the phrases “barrier-free” and “universal design” are used interchangeably with “aging in place”, which is another way to say that all members of the family are able to function in the space, regardless of age and ability. According to the most recent report from the AARP Public Policy Institute, most adults age 50 or older want to age in place and stay in their current homes; and 87 percent of those over age 65 want to stay in their residence for as long as possible. I know that’s what I’ll want later on in life. What about you? Just like investing and retirement planning, it’s never too early to think about remodeling your existing kitchen so you can use it comfortably for the next 40 or 50 years. 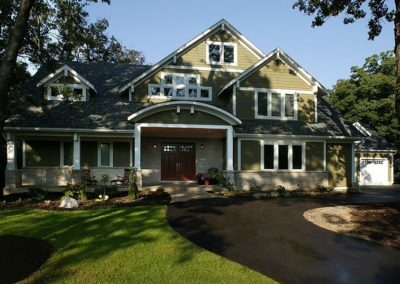 When you work with me, I’ll assemble the best team for your aging in place kitchen remodel; securing the right kitchen designer is step one, and I have relationships with some of the best in the Chicagoland area. Kitchen designers have that unique depth, expertise and understanding of how to achieve a functional plan that’s timeless and beautiful. John Carlile’s article on the National Kitchen & Bath Association (NKBA) Web site titled “Age shouldn’t be a limitation in the kitchen” is an excellent first-read on this topic. In it, he says that “function is still the key element to great design.” I couldn’t agree more! This means that the overall layout and location of all features in the kitchen (cabinetry, appliances, countertops, sinks, aisle clearances and more) is crucial for the homeowners’ successful ability to move about and function with ease. 1. AISLE WIDTH: Should be a minimum of five feet (60”) to be prepared for possible wheelchair use in the future. 2. BARRIER-FREE FLOW: Remove threshold areas to allow barrier-free entry and exiting from the room. 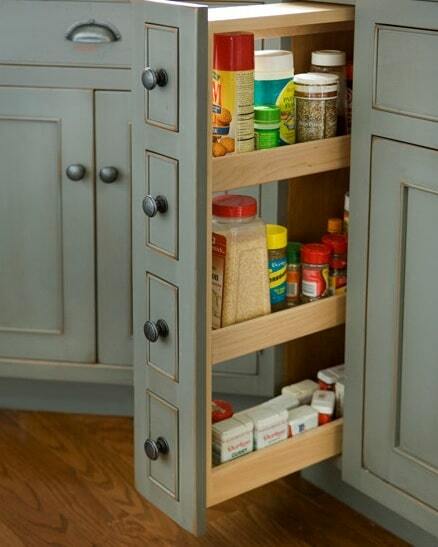 Pictured above: Custom kitchen pantry pull-out designed by Nancy Hanson of Heartwood Kitchens. 3. SINKS, HARDWARE AND APPLIANCE CONTROLS: Must be easily operable with one hand. Choose single-lever faucets. For cabinets and drawers, D-ring or loop pulls are recommended over knobs because they are easier to grip. 4. FLOORING: Must be non-slip, durable and easy to clean (I offer more suggestions below). 5. HEIGHTS: Countertops should vary in height. Include lower counters to accommodate seated users. Appliances and cabinets should be lower than standard (I address specific areas below). 6. STORAGE: For easy access and to eliminate the need for reaching and digging, it’s imperative to have pull-out drawers, slide-out shelves, roll-out cabinets and lazy Susans as storage for common kitchen items. 7. LIGHTING: Bright task lighting is a must-have for food-prep or bill-pay areas. Consider LED in-drawer, in-cabinet and under-cabinet lighting as well. 8. CONTRASTING MATERIALS: Don’t even think about the monochromatic look. Countertop, backsplash, cabinet and flooring colors should contrast with one another so they are easier to see! Pictured above: This project from Cabinets by Design shows a pull-out drawer with a cutting board. Also notice the smart choice of contrasting colors and materials throughout. 9. PULL-OUT WORK SURFACES: Pull-out work surfaces are convenient for anyone, but they are especially necessary for wheelchair users. Pull-out drawers, table-style islands and peninsulas with only legs (no cabinets) are all good ideas that allow roll-up access with plenty of knee space. Pictured above: This kitchen featured in Better Homes & Gardens includes raised based cabinetry with deep and high toe kicks, as well as upper cabinetry that rests closer to the countertops. 10. 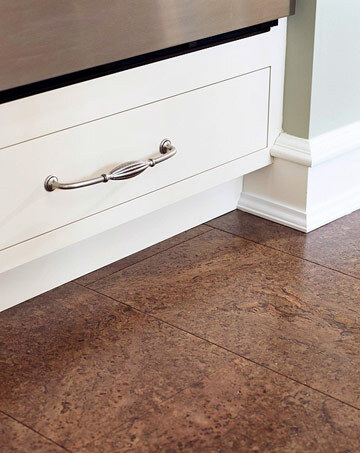 RAISED BASE CABINETS: All base cabinetry should be higher off the floor than standard, which allows for taller toe-kicks (toe kick depth should be at least 6” deep and its height should be between 8” – 9”) for wheelchair foot rests and easier access with less bending. The base cabinet (including the top of the counter) should be approximately 34 ½” from the finished floor. 11. LOWERED UPPER CABINETS: The standard distance between the countertop and upper cabinets is 18”. However, to make upper-cabinet shelving more accessible, mount them slightly lower at 14” from the countertop, or 48″ above the finished floor. 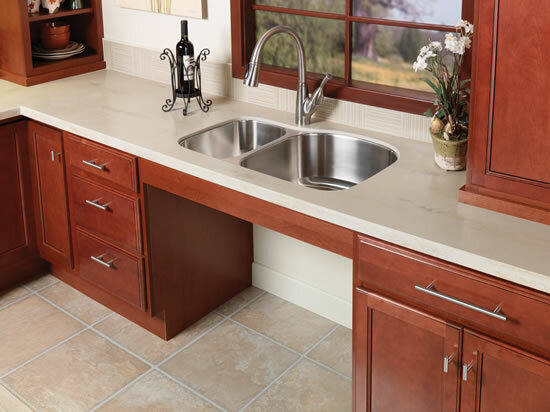 Pictured above: An accessible sink design by QualityCabinets. 12. SINK DESIGN: Sinks should have open space underneath for wheelchair use, but with a panel in place to guard against contact with hot pipes. All of us will shrink with age … and guess what? It starts at age 40 when we will lose about four-tenths of an inch of height every decade. So, the very first subject we need to wrap our collective heads around when it comes to appliances is height. In order to avoid bending as much as we can while cooking and cleaning, it’s best to select and install appliances that can be placed at comfortable heights and locations. Choose ADA-compliant appliances. Whirlpool, GE and other national appliance manufacturers offer appliances that comply with the Americans with Disabilities Act (ADA). Whenever possible, a good kitchen designer will recommend appliances mounted on the wall or located in drawers to avoid bending. Wall ovens should be mounted at shoulder-height. Many appliance companies manufacture “drawer appliances”, such as dishwashers, microwaves, refrigerators and freezers. Pictured above: Notice the varying surface heights, the extra space under the sink, and the lowered, wall-mounted oven in this accessible kitchen designed by ROM Architecture Studio. Ranges, cooktops, and dishwashers have a maximum high forward reach of 48 inches for controls, and a maximum low forward reach of 15 inches. 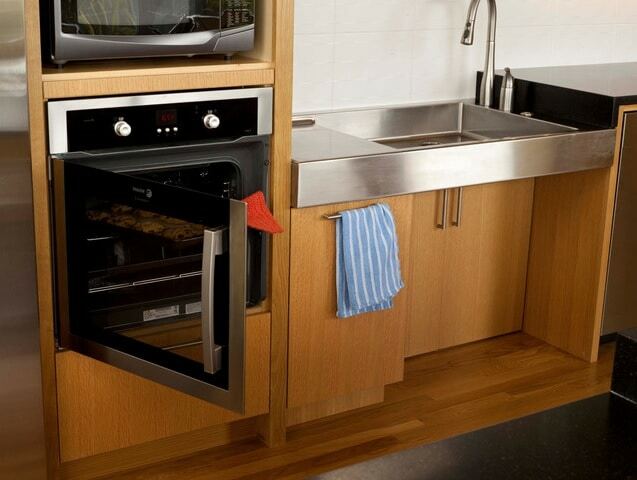 Ovens or cooktops with knee space underneath must be insulated or otherwise protected to prevent injury. All dishwasher rack space must be accessible from the front of the machine for loading and unloading. 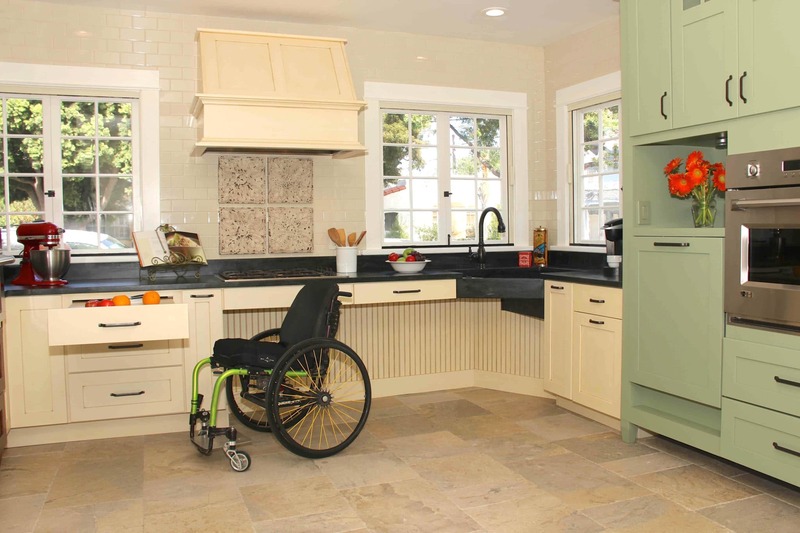 Controls for top-freezer or side-by-side refrigerators must allow a parallel approach by a person in a wheelchair with a maximum high side reach of 54 inches. Top-freezer refrigerators must have 100% of the fresh food space below 54 inches and 50% of the freezer space below 54 inches. Pictured above: This kitchen featured in Better Homes & Gardens magazine features cork flooring. As I mentioned before, opt for tough, non-slip, non-skid, low-maintenance floors for your universal kitchen. The best man-made (engineered) choices are actually solid vinyl and solid rubber. The best natural choices are cork and hardwood floors. Caution: pick only the hardest type of wood available and discuss the construction technique and finish materials with your contractor if choosing hardwood. The World Floor Covering Association charts a list of the hardest, most durable types of wood floors available. Hopefully this gives you some basic ideas as you start planning for your next great kitchen. Call me to chat more!